Daughter of Ethbaal, King of Sidon, and wife of Ahab, second king of the fourth dynasty of Israel, founded by Omri (I Kings xvi. 31). This marriage was the culmination of the friendly relations existing between Israel and Phenicia during Omri's reign, and possibly cemented important political designs of Ahab. Jezebel, like the foreign wives of Solomon (ib. xi. 7, 8), required facilities for carrying on her form of worship. So Ahab "reared up an altar for Baal in the house of Baal, which he had built in Samaria, and Ahab made the Asherah" (ib. xvi. 32, 33, R. V.). The aggressive character of Jezebel went so far as to require that her religion should be the national religion of Israel. She organized and maintained gilds of prophets, 450 of Baal, and 400 of Asherah (ib. xviii. 19). She also destroyed such prophets of Yhwh as she could reach. Obadiah, the faithful overseer of Ahab's house, rescued one hundred of these, hid them, and secretly fed them in a cave (ib. xviii. 3). The violence, bloodshed, and idolatry occasioned by Jezebel, and apparently assented to by Ahab, aroused the indignation of the prophet Elijah. Ahab was charged directly with the sin of following the Baalim (ib. xviii. 18). The superiority of Elijah and of his God in the test at Carmel, and the slaughter of the 450 prophets of Baal, fired the vengeance of Jezebel. Elijah fled for his life to the wilderness, where he mourned the devotion of Israel to Baal and the lack of worshipers of Israel's God. He was sharply rebuked with the words, "Yet will I leave me seven thousand in Israel, all the knees which have not bowed unto Baal, and every mouth which hath not kissed him" (ib. xix. 18). The determination and unscrupulousness of Jezebel are best illustrated by her false charges against and her murder of Naboth and his sons (ib. xxi. 7-16; II Kings ix. 26) to satisfy the whim of Ahab. For this base deed Elijah pronounced upon Ahab and Jezebel and their house a ghoulish prophecy (I Kings xxi. 21-24) which was promptly fulfilled (ib. xxii. 38; II Kings ix. 26, 35, 36). 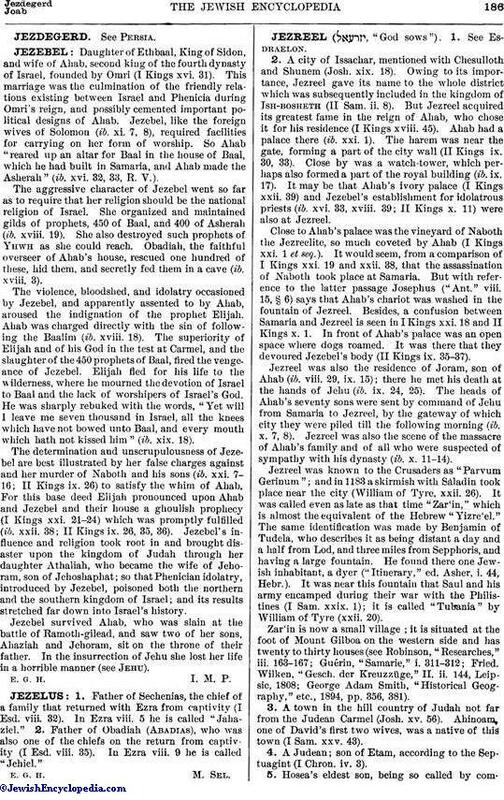 Jezebel's influence and religion took root in and brought disaster upon the kingdom of Judah through her daughter Athaliah, who became the wife of Jehoram, son of Jehoshaphat; so that Phenician idolatry, introduced by Jezebel, poisoned both the northern and the southern kingdom of Israel; and its results stretched far down into Israel's history. Jezebel survived Ahab, who was slain at the battle of Ramoth-gilead, and saw two of her sons, Ahaziah and Jehoram, sit on the throne of their father. In the insurrection of Jehu she lost her life in a horrible manner (see Jehu).